Ready for another advent calendar in story form? The idea behind an advent calendar is to sweeten the wait until Christmas. There are twenty-four pockets, and starting December 1, you can open one each day. Standard advent calendars are filled with chocolate or toys. I fill ours with a story—plus some candy, because we all know children can't live on words alone. Feel free to read my story yourself, with your kids, dogs, cats or anyone else. There's one bite of story for each day until Christmas Eve. If you'd like to see what our calendar looks like (hint: socks! ), or read stories from previous years, click here. Once upon a time, there was a mean, green creature who stole Christmas. Then his heart grew three sizes, and he gave all the Christmas goodies back. Only that wasn't the end of the story. By New Year's Day, the Grinch's heart shrunk just a bit. Before the snow had melted, the Grinch got tired of all the Whos' singing and smiling. Their la-la-la made him cr-cr-cringe. His heart shrunk one more size. By March, he was completely annoyed every time those Whos made a rhyme. His heart shriveled further. And what the Grinch absolutely, positively HATED were bunnies. You know what holiday came next? Easter. At the thought of Easter, the Grinch frowned and scowled. With his heart back to its tiny, original size, he attached wheels to his sleigh, decorated it with pink streamers, colorful baskets and purple eggs, and rolled all the way down from Mount Crumpit to Whoville. The Whos greeted the Grinch with smiles and heeheehees and hahahas. The Grinch tried to smile back, but the corners of his mouth turned down and he said, "Hello, you—." He wanted to say "boring." He wanted to say "stupid." Instead, he grunted, "—friendly Whos." While they were at work and in school, the Grinch broke into the rabbit hutches and stole all the rabbits from Whoville. Then he broke into the houses and found all the plastic eggs and chocolate bunnies and cute little Easter chick drawings. When his sleigh was full, he trudged back up Mount Crumpit. The day of Easter came and went. The Grinch perched on a cold rock, his mouth twisting from a frown to a smile as he imagined all the Whos' sad faces. All alone in the cold, cold wind, he stuffed all those chocolate bunnies in his mouth...until he had a HUGE belly ache. All through the year, the Grinch stayed up in his cold, damp cave. When the evenings grew darker and the leaves began to fall, he realized another holiday was coming. And this next holiday was a terribly fun one too: Halloween. He couldn't allow the Whos to have that much fun. So the Grinch ripped the faded pink streamers from his sleigh and decorated it with pictures of black cats and smiling vampires and green monsters (not too different from himself!). Once again, he rolled down Mount Crumpit. The Whos greeted him with smiles and heeheehees and hahahas. While the kids were in school and the parents at work, he collected all the jack-o-lanterns from the front porches. He ripped pictures of ghosts off walls and fake spider webs from doorways, and he stuffed every costume he found into a sack. Finally, he scrounged in cupboards and stole all the Halloween candy. Up on Mount Crumpit, the Grinch sat, his feet freezing on the rocky ground. He remembered the belly ache from Easter. As you can imagine, that memory made him EVEN GROUCHIER. So he decided not to eat all the Halloween candy this time. It would be so much worse if he wasted it. So, he went to the side of the mountain and dumped it all over the edge: the jack-o-lanterns, the ghost pictures, and the costumes. And on top of that, packages of gummy bears and caramel and chocolate bars and lollipops. One month later, when it came time for the next holiday, the Grinch kicked the Halloween pictures from his sleigh. He slapped turkeys he made by tracing his hand onto the side of the sleigh, and he traveled down Mount Crumpit to Whoville. The Whos greeted him with smiles and heeheehees and hahahas. While the kids were playing in piles of dried leaves and the parents bought last minute necessities, he scraped the pumpkin and turkey pictures from the window of each house. He opened the refrigerators and stole the turkeys, the mashed potatoes and the corn. He piled all the pumpkin pies in one towering, wobbling stack. Then he drove the sled back up Mount Crumpit. The Grinch still hadn't forgotten that belly ache from Easter, so he went directly to the edge of the mountain and tipped the sled. Down flew the adorable turkey pictures. Down flew the turkey and the mashed potatoes and the corn. And like Frisbees in the wind, down flew the pumpkin pies. It began to snow, and the frost did not improve his mood. The Grinch grew icier every day. One week before Christmas, he took the wheels off his old, rickety sled. He ripped off all the Thanksgiving decorations. Then on Christmas Day, he put on his old, tattered Santa hat and tied the horn on his dog's head. Together, they stomped through the snow down to Whoville. When the Grinch reached the town square, the Whos greeted him with smiles and heeheehees and hahahas. What is wrong with these Whos? he wondered. They'd lost Easter and Halloween and Thanksgiving. They had to know a disaster was coming. They should be SAD. They should be AFRAID. Instead, Cindy Lou Who took hold of his hand and smiled a sweet, sweet smile. "I'll help you, Mr. Grinch!" she said, her eyes sparkling. The Grinch grunted and squinted his grouchy eyes at her. "Come along, Mr. Grinch," said Cindy Lou's dad. "No need for you to do all the work at every holiday." These Whos were not making sense. They were supposed to go to church or to do last-minute shopping so he could sneak into their houses and steal all their decorations and presents and goodies. Instead, they held his hand and pulled him through the town square and around to the back of the church. There was a beautiful gold sleigh with a soft, red velvet bench. The seat was heated, and so was the spot for the driver's feet. Four horses were hitched to the front. And this sleigh—it was filled with food and presents and Christmas trees and lights. And there was a brand new Santa suit on the seat. "Here, Mr. Grinch! We think it will fit you well," said Cindy Lou Who. She jumped up and tugged off his old hat. Then she handed him the new clothes. The new Santa suit was soft and warm. And so cuddly, his dog rubbed up against him. The Grinch tried not to smile—he pushed his mouth muscles down as hard as he could. But the corners of his mouth turned up all the same. Then the Mayor strode out of the church with a big smile on his face. "There you are! Mr. Grinch, we'd like to thank you. We've all been so caught up in making the perfect holidays, that we forgot about our poor, poor neighbors on the other side of Mount Crumpit." The Grinch scowled. The poor neighbors? Yes, the people in Poorville had only cold huts and cold porridge and torn clothing and no TVs. "What about them?" grumbled the Grinch. "Well, the mayor of Poorville came by to thank me after Halloween. For the decorations and the candy. I didn't understand. Then he came again a month ago, after Thanksgiving. He said everyone was so grateful for the food and the adorable turkey drawings, especially the nicest one, in a hand shape." The Mayor nodded very wisely. But the Grinch still did not understand. "Where did the poor people in Poorville get all these things?" The Mayor clapped the Grinch on the back. Cindy Lou Who giggled and held onto his hand. Cindy Lou's dad said, "Oh, you don't need to play with us anymore. We guessed your little trick, Mr. Grinch. We know you've been taking all our things." The Grinch's eyebrows squeezed together. "You know? And you're not mad?" The mayor clapped him on the back again. "Of course not. Not when we realized you were showing us how important it is to SHARE!" When the Mayor clapped the Grinch on the back a third time, and Cindy Lou Who wrapped her little arms around him for a humongous hug, that too-small heart not only grew, it grew bigger. Stuck big. 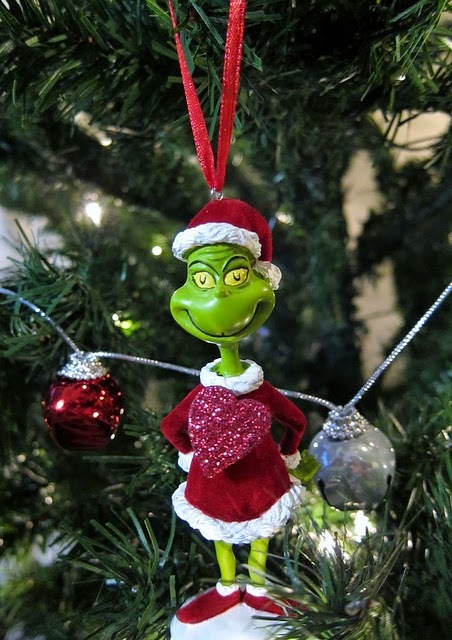 Warmed by such a big heart, the Grinch smiled and smiled. And the Mayor pushed the Grinch onto the toasty, plush seat of the new sled. "Thank you for delivering our donations to our neighbors in Poorville!" "Thank you, Mr. Grinch," said a Who-woman. "Thank you, Mr. Grinch!" called a Who-man. "Mr. Grinch?" asked Cindy Lou Who, "Will you come to our house for Christmas dinner today? Please?" The Grinch nodded, and as he drove the four beautiful horses toward Poorville, his new, warm heart—stuck big—would not let the smile slip from his face. Note: I do not own the rights to The Grinch. But I am a very big fan.